Lundberg Family Farms has been selected as the recipient of the 2018 California Leopold Conservation Award®. The award is presented annually by Sand County Foundation, Sustainable Conservation, and California Farm Bureau Federation. Lundberg Family Farms of Butte County will receive a $10,000 award and a crystal depicting Aldo Leopold at the California Farm Bureau Federation’s Annual Meeting in San Diego on December 5. Lundberg Family Farms has a long commitment to sustainable farming methods that produce well-known rice products while improving and protecting the environment for generations to come. Started in 1937, the farm is a multi-generation organic rice farm and innovative rice products processor. As a result, they began to grow rice in an unconventional way. By the 1960s, the Lundberg brothers saw the need to become their own processor, and sell their rice directly to consumers. Today, the third and fourth generations of Lundbergs embrace the family’s conservation heritage of using agricultural practices to protect soil, air, and water. Since the 1980s, the Lundbergs have rescued duck eggs ahead of the rice harvest. In partnership with wildlife conservation groups, the eggs are collected, the ducklings are raised in hatcheries, banded with California Department of Fish and Game tags, and released back into safe habitats. These efforts have saved more than 30,000 ducks. 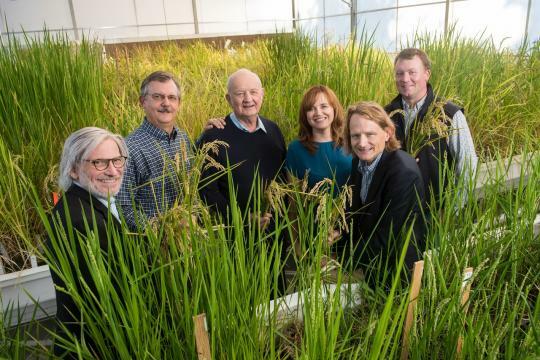 The Lundbergs’ work to encourage water conservation, rotate crops, grow cover crops, and use natural methods for pest control, have made them a leader in organic rice production and wildlife-friendly farming. These techniques are shared with others through farm tours. Among the many outstanding landowners nominated for the award were two finalists. Rominger Brothers Farm, a diversified farm and ranch in Yolo County that has made significant habitat improvements. Sweet Haven Dairy in Fresno County is a pioneer in irrigation water management and conservation tillage. The 2017 recipient was C. Jeff Thomson, Thomson International, Inc. a Kern County grower of fruits and vegetables with many wetland conservation achievements. The Leopold Conservation Award in California is made possible thanks to the generous contributions from American Ag Credit, The Nature Conservancy, Farm Credit West, The Harvey L. & Maud S. Sorensen Foundation, and California LCA Recipient alumni. This entry was posted in Conservation, Environment, State Board of Food and Agriculture. Bookmark the permalink.